Do I need any special shoes or gear to participate in any of the GRT events? First, the short answer – No. Now the not so short answer. Shoes – In dry conditions, the GRT is quite runnable in normal road shoes. Keeping in mind the date of the race, dry conditions might not be realized. Decent trail shoes may help keep you upright and protect your feet from the rocks and roots they surely will encounter. What types of food and drinks will be at the aid stations? 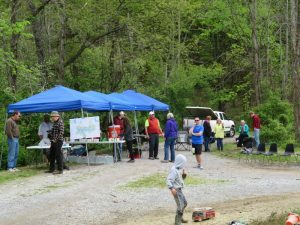 The Route 528, Jennings, and Swamp Run aid stations will be well stocked with typical ultra food and munchies, including chips, pretzels, cookies, candy (e.g., M&Ms, gummies), and PB&J sandwich squares. It is likely that these stations will also have some type of soup and grilled cheese sandwiches. Fluids at these stations will be water and a sports drink, most likely Gatorade. The Mount Union Road self-serve fluids station will be water only with disposable cups, runners with water bottles are asked to fill bottles and not use disposable cups. Will there be gels at the aid stations? Yes, Hammer gels of limited flavors will be available. However, it is recommended that runners bring their own supply to ensure the desired flavor are available for race day. This is in keeping with the objective of making the 30K an “introductory” race, to encourage runners to experience long-distance trail hiking/running without having to acquire a lot of specialized gear that would be needed for a more remote event with less frequent support. With the use of the self-service, fluids-only aid station at Mt. Union Road, fluids are available at mile 4.8, 9.3, and 13.8 on the 30K course, making it possible to complete the course, with a single, hand-held water bottle. A small waist pack may be useful to carry a few energy gels or bars, some basic meds, and a couple band aids. Can I upgrade or downgrade from one distance to another? Yes, but only in advance of race day and only if the race you want to transfer to has not reached its field limit. No refund of the difference in entry fee will be given. Once you have started a race, if you alter your distance, you will be assigned DNF status. For instance, if you start the 50 Mile race and decide en route it’s not a good day, so you cut it short and run 50K instead, you will get in a nice training run, but will be assigned DNF status in the 50 Mile results.